Before going forward, it’s appropriate to look back. Reclaiming Futures and JDC: SIP have co-existed in many juvenile justice jurisdictions. OJJDP funded a number of grants to implement both Reclaiming Futures and JDC: SIP. Subsequently, they funded a cross-site evaluation that examined the implementation process, youth changes over time, and costs of Reclaiming Futures and the combined Reclaiming Futures and JDC: SIP approach. Findings from this study were used to support the empirical basis for some of the JDTC objectives. Of relevance, Greene and colleagues (2016) developed a logic model blending Reclaiming Futures and JDC: SIP. The authors indicated the two approaches are complimentary and aim to achieve the same goals: reduce/eliminate substance use and future crime. They indicated Reclaiming Futures and JDCs both emphasize (1) developing team collaboration (2) expanding the network of services through community partnerships, (3) focusing on youth strengths, (4) involving and engaging the family, and (5) monitoring and evaluation. Greene and colleagues also noted some differences. 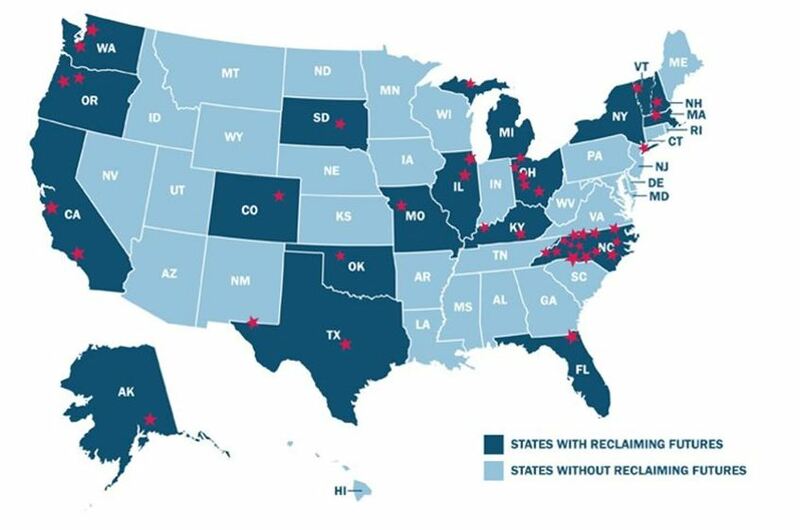 As compared to JDCs, Reclaiming Futures is a broader approach, recommends a greater number of individuals involved in collaboration process, works towards system change rather than implementing programmatic activities, and places a greater emphasis on community directed engagement following services and supports. Many of the commonalities and differences between Reclaiming Futures and the JDTC Guidelines remain the same. Both have expanded and enhanced their approaches and models using research. Both have focused on the importance of culture and language – Reclaiming Futures through its decision-making approach to reduce racial and ethnic disparities in behavioral health decisions and JDTCs through explicit guidelines that address culture and language. JDTCs increased its emphasis on case management and continuing care and Reclaiming Futures has added a brief intervention for youth who do not need higher level of care. JDTCs continue to focus on the individual treatment needs such as trauma and co-occurring issues and Reclaiming Futures focuses on system issues to improve the identification, screening, assessment and coordination of these individualized services. Both the development of the JDTC Guidelines and Reclaiming Futures cross-site evaluation has highlighted the need for rigorous research and evaluation to help the field better understand the effectiveness of interventions designed for youth and families involved in juvenile justice. We are entering this next phase of implementation and research of JDTCs with the release of OJJDPs notice that it is seeking applications for funding specifically for JDTCs. This is an important time for us to use the knowledge gained, continually improve systems, services, and supports, and let research guide development. Implementation and research of the seven JDTC objectives will advance our understanding of JDTCs effectiveness for youth and families with substance use disorders. Based on the Reclaiming Futures cross-site evaluation study, juvenile justice jurisdictions may achieve extra value in terms of youth and family outcomes and cost savings by blending Reclaiming Futures and JDTC Guidelines. Determining the best approaches to meet the needs of youth and families within different contexts requires deliberate and thoughtful considerations of a multitude of issues for which Reclaiming Futures sites are very experienced.